The Martha Stewart Living Modern 1 in. Bedford Nickel Groove Knob is attractive and functional. This knob has a smooth design that is accented by the handsome Bedford nickel finish. The rear-mount design and included fastener make installation easy. Brushed nickel finish. Sharp cone look. Premium brass/zinc construction. Includes 0.75-inch truss head screw. Lifetime warranty. Easy to wipe & clean. Quality control approved in Canada. Re-inspected prior to shipping your order. 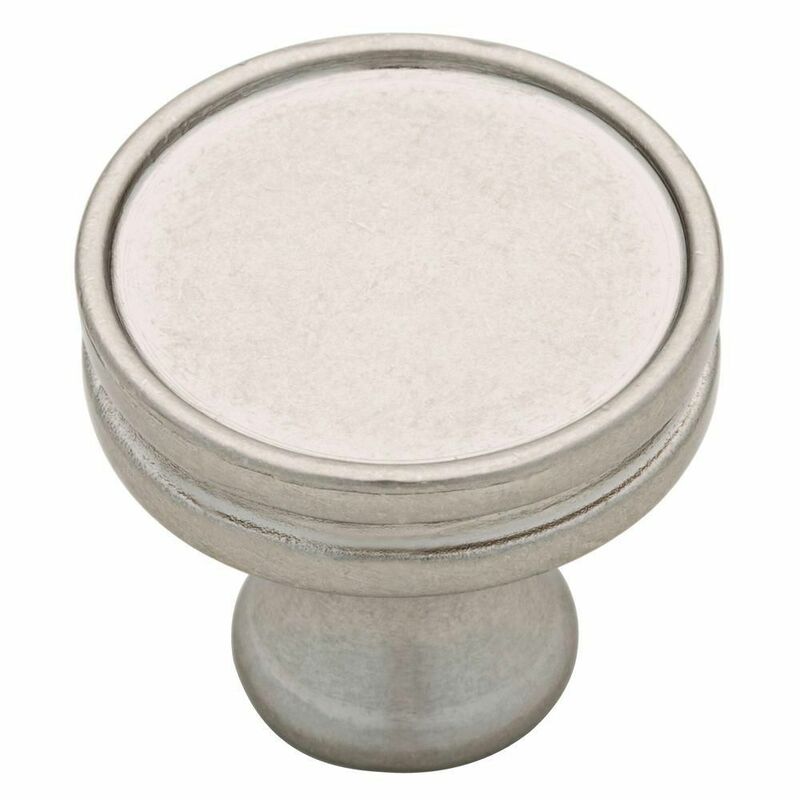 The Amerock TEN1387G10 Allison Value 1-1/4in(32mm) DIA Knob is Finished in Satin Nickel and comes in a pack of 10. From rustic to modern-day casual to sophisticated beauty, The Allison Value Collection offers a variety of designs, making on-trend, quality hardware affordable. The classic Satin Nickel finish provides a sleek, lightly brushed, warm grey metallic look. 27mm Groove Knob The Martha Stewart Living Modern 1 in. Bedford Nickel Groove Knob is attractive and functional. This knob has a smooth design that is accented by the handsome Bedford nickel finish. The rear-mount design and included fastener make installation easy. 27mm Groove Knob is rated 5.0 out of 5 by 3. Rated 5 out of 5 by CharisM from Very nice looking knob. A softer finish and a little... Very nice looking knob. A softer finish and a little brighter than a typical satin nickel, with a soft reflection on the flat front. Comfortable on the hand. Really nice finishing touch. Rated 5 out of 5 by thatguy from look great These knobs look great, and didn't cost too much. Installation is the same as every other knob and that look like they will hold up just fine.